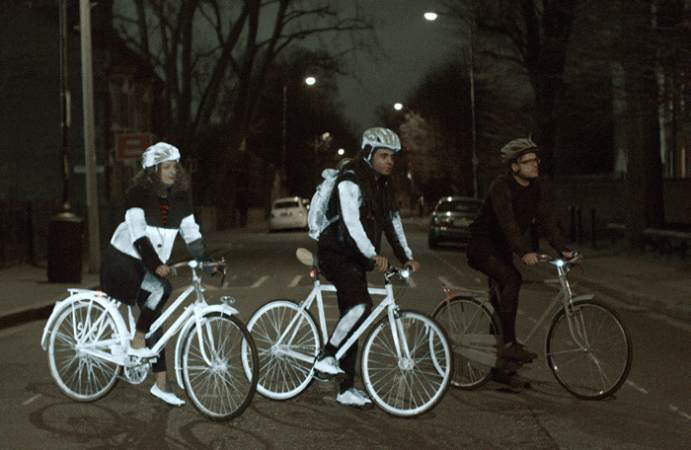 Buzz Blog: Bicycle Safety: How does Volvo's new invisible reflective paint work? Life Paint was created for Volvo by Albedo100, a Swedish company that makes a range of reflective paints for gear and animals. According to their website, the two key ingredients of these paints are a transparent glue and reflective microspheres. with an optional reflective surface. Microspheres are also used in reflective fabrics such as high-visibility jackets, and work on the principle of retroreflection. 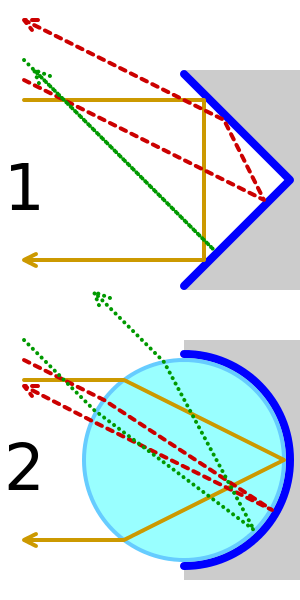 Retroreflection bounces light rays around a 3D reflective surface in order to send the rays back in the direction of the source. For microspheres, this is achieved by carefully selecting the type of material (usually glass) so that the light coming into the sphere bends (refracts) in just the right way so as to reflect off the back wall of the sphere and travel out in the same direction as it came. Sometimes half of the sphere has a metallic coating to increase its reflectivity, but this is unlikely in the case of a reflective paint since the embedded microspheres could have any orientation. Reflectors on bikes and traffic signs also use retroreflection. These objects achieve a higher reflectivity over long distances by using corner-shaped reflectors. These corner reflectors are better than microspheres at reflecting light in exactly the same direction without much scattering and are often tiled together to create a larger reflective surface. Retroflection is not just for traffic safety—it's also used in some barcodes to make it easier to scan the codes from a distance. 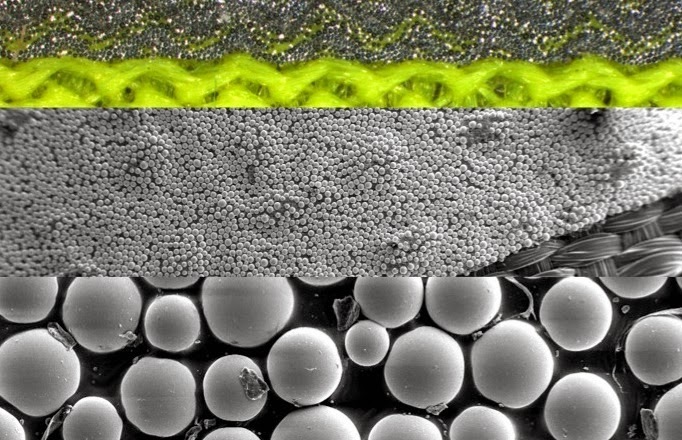 The microspheres in a retroflective tape shown at increasing magnification from top to bottom: 8 X, 15 X, 200 X. A significant fraction of bicycle collisions with cars are caused by the car driver not seeing the cyclist: a 2014 report of UK cycling accidents reported that 57 percent of serious cyclist collisions were caused by the driver "failing to look properly". Many pedestrian safety reports advocate using lights and reflective, high-visibility clothing to increase visibility and prevent an accident—indeed this is the slogan of Volvo's Life Paint campaign, "The best way to survive a crash, is not to crash". Surveys of real-life cycling collisions are inconclusive about the effect of high-visibility clothing and lights in reducing collisions, with some suggesting that lights or bright clothing make the cyclist feel safer, and thus more likely to take risks, than those without. 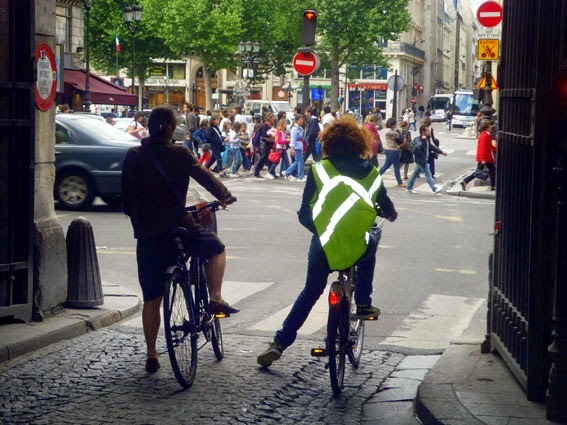 But an Australian study has shown that reflective gear or lights attached to moving parts (for example, the ankles and knees of cyclists) are more likely to prevent a collision than a static high-visibility jacket or light. A reflective paint that is invisible except in the glare of a headlight could appeal to a wider range of walkers, cyclists, and motorcyclists that want to be seen in crucial moments but don't want to wear high-visibility gear. Just be sure to spray it on some moving parts. What if you want to apply it permanently ? ?